It’s been a while since I’ve worked on the pattern for Section 1 of the Tea Cloth, but I finally went back and added notes to all the pictures, added some new pictures and generally went through and updated the pattern. I have some emails out to potential test tatters and a few more to send. Hopefully, it won’t be long till I have a finished version of the pattern published. I’m pretty excited about this piece. 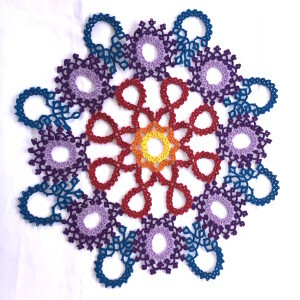 It’s going to be on display at LACIS in Berkley, CA at their Tatting Exhibit this summer. I drove through Berkley in December on my way to San Diego and got a sneak peak at the exhibit while I dropped off my piece. I’m pretty sure they still hadn’t collected most of what will be on display and it was already an amazing collection. I can’t wait to see it once it’s actually up and am so excited to be a small part of it. Of course, this piece that I’ve tatted is only the first (and smallest) section of a MUCH bigger piece. It’s the tea cloth from Priscilla Tatting Book #2. The green and yellow piece I mentioned a couple weeks ago is the next section of it. I’ve seen a version of it at the Lace Museum in Sunnyvale, CA that takes it through section 3 (that was a couple years ago, so I’m not sure if it’s still on display. Does anyone know?) Wodentoad on Craftree is doing an amazing job at consistent steady progress and is on the last section of it. I can’t wait to see how it comes out! Here’s a link to the forum thread about her progress, though I think you need to log into Craftree to be able to read it. 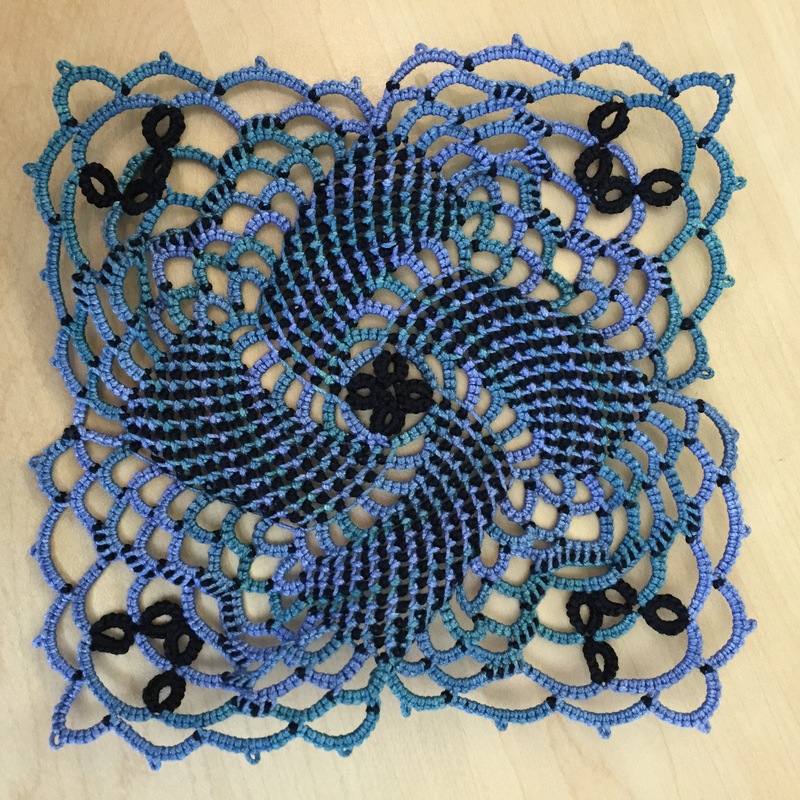 As I usually do, I’ve been bouncing around with different versions of this project (as well as many other tatting projects). I’ve got a least 7 versions of the tea cloth started, all in different stages. One day, I’ll have to collect them all together and snap some pictures. Some I’ll finish eventually, but some are just trial runs as I am modifying the pattern as I go to make it work for me and for modern techniques and tatting. Getting this draft of the pattern put together is pretty exciting to me. I’ve had this goal of rewriting the patterns from the Priscilla Tatting Books and I’ve been working on it for the last few years, but this is the first pattern where I feel like I’ve actually gotten down a work-flow for making the samples, taking and editing the pictures and putting together the patterns. Hopefully future patterns (from the Priscilla books and others) won’t take me as long to put together now that I’ve figured out a process that works for me! This is one of the project we did at Camp Wannatat last month. 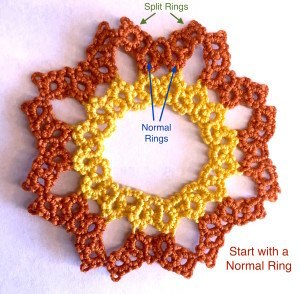 It’s Dora Young pattern that Heidi Nakamura rewrote and taught. 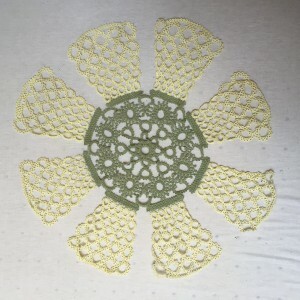 I realize as I try to describe it that I don’t know if I should call it a doily or a motif. 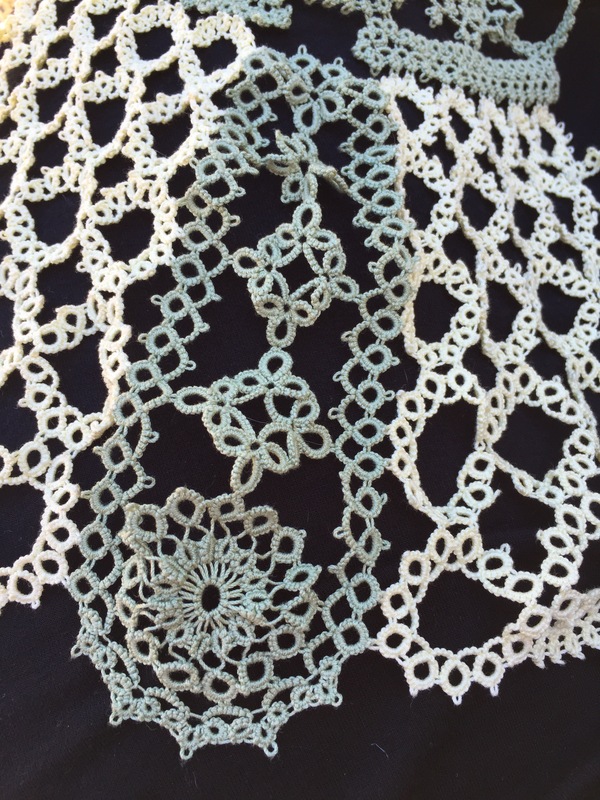 When does a motif become a doily? Is it the physical size of the finished piece or the number of rounds? 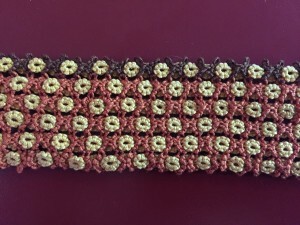 This one is done all in one round, but it’s about 7 inches wide, done with a Snapdragon Lace size 3 hand dyed thread and black. Why size 3? I really don’t know. I wanted to do a HDT and while choosing I just sort of gravitated to them for something different. I know a lot of people don’t like size 3, but I think it definitely has it’s place. I was also thinking of doing it in size 80, just to see what that would look like. If I did, the final piece would only be a couple inches wide. Would that make it a motif? On this lovely spring day in Seattle, I’m hanging out in the backyard with the dog, working on the tea cloth from Priscilla Tatting Book #2. I’m trying to do the inserts between the panels of the second section and am coming to the conclusion that I should have done these pieces before the panels. They’re made up of 4 connected motifs surrounded by rings and chains that connect them to the panels. 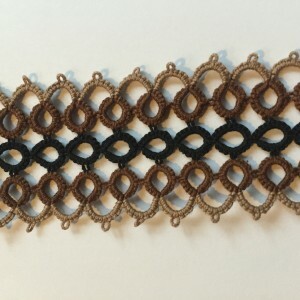 It’s that ring and chain portion that I’m doing now and it’s not that it’s hard in any way, it’s just hard to track if you’re joining it both to the set of motifs and the panels in the same round. Since these pieces are only connected to the panels and not the inner set of rounds, it would be easier to just make the right pieces and then join to the panels while doing those. So that’s how I’ll write the pattern and that’s how I’ll try it next time. Yes. There will be a next time. In fact, in the process of writing this pattern I’ll probably end up with a couple of these. Hopefully all of them can be tatted in such nice weather. 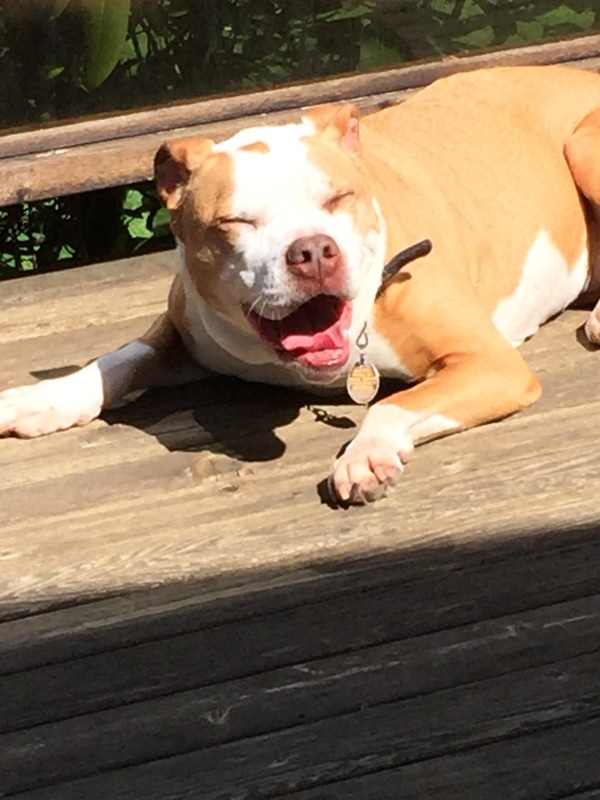 I’ll leave you with a picture of the dog enjoying the sunshine. All pieces except for the earrings include split rings. Other than that, it’s just rings, chains, picots and joins. 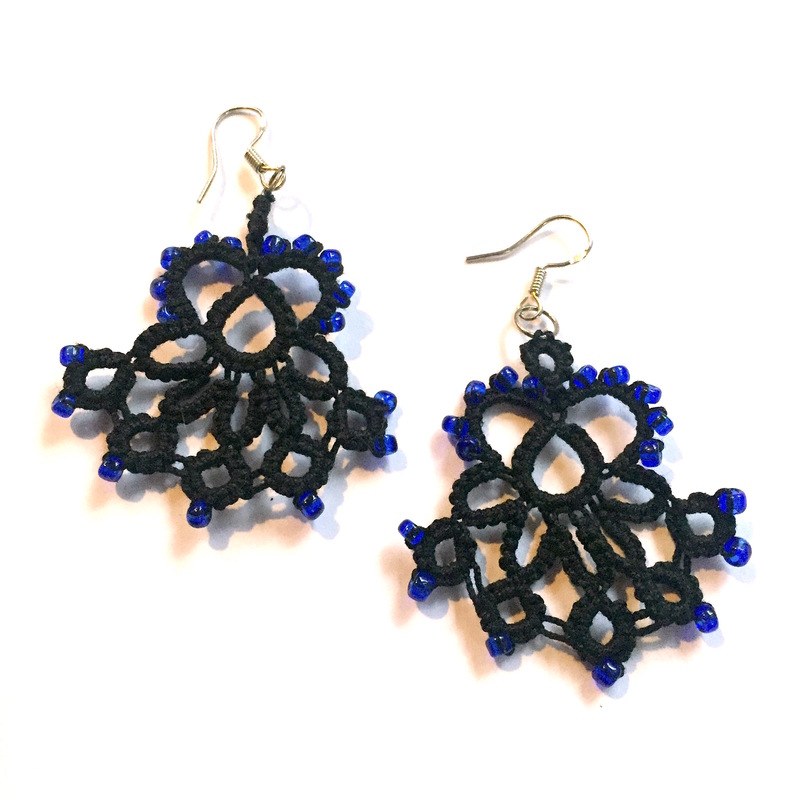 If you’re interested, send me an email or comment below with your email and which pieces you’re interested in test tatting. Thanks! 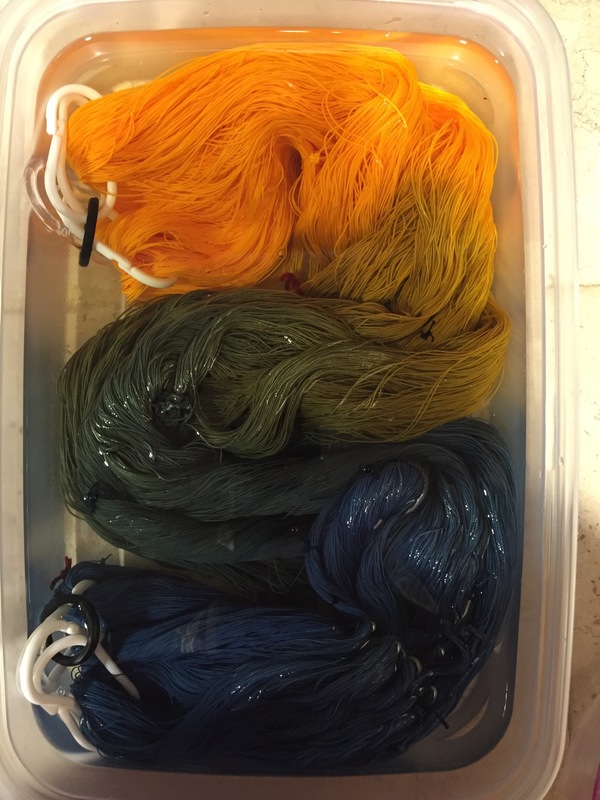 I’m getting ready for the Shuttlebirds conference and Camp Wannatat with some new thread colors! I’ve spend the last month or so winding up skeins so that I can focus on the dyeing now. This is the first batch of 2016. It’s a custom color request. I played around with the colors yesterday with some sample threads and now here it is today in sizes 10 and 20 sitting in the fixer bath. It goes from a deep yellow through a spectrum of greens to a nice bright blue. I can’t wait to see it once it’s dry. I’m going to call it Tropical since that’s what the woman who requested the color combination called it. It so nice to be playing around with colors again. I’ve got a ton of wound skeins ready for color and am looking forward to playing around over the next month. excited to have finished this version of the first section of the tea cloth. It’s just the tiny center part of the complete piece, but for this version I’m stopping here as a sample of that center. I’m really happy with the way it came out and how the colors all worked together. I did it in these rainbow colors because I wanted to show how the individual rounds were done. I pulled out the bottom half of all the small circular motifs of the second round and did them as single piece. Then combine the top half of those motifs with the circular motifs of the third round and traveled around the piece using split rings to get from one circular motif to the next. It was so nice to only have 4 ends to hide at the end of that rather than the 32 that would have resulted from doing them all separately. I’ve also finished writing up the pattern for this. Actually, I finished it while doing the yellow and green one months and months ago and doing this version was my way of checking the pattern. Next up to format the pattern and add the pictures. It will be exciting to have this small version of the piece written up. Still lots to do for the whole tea cloth, but this feels like a nice milestone. Here is the other piece I’ve been working on using the tea cloth pattern. The green part in the center of this one is as far along as I’m going to go with the rainbow version I shared earlier. 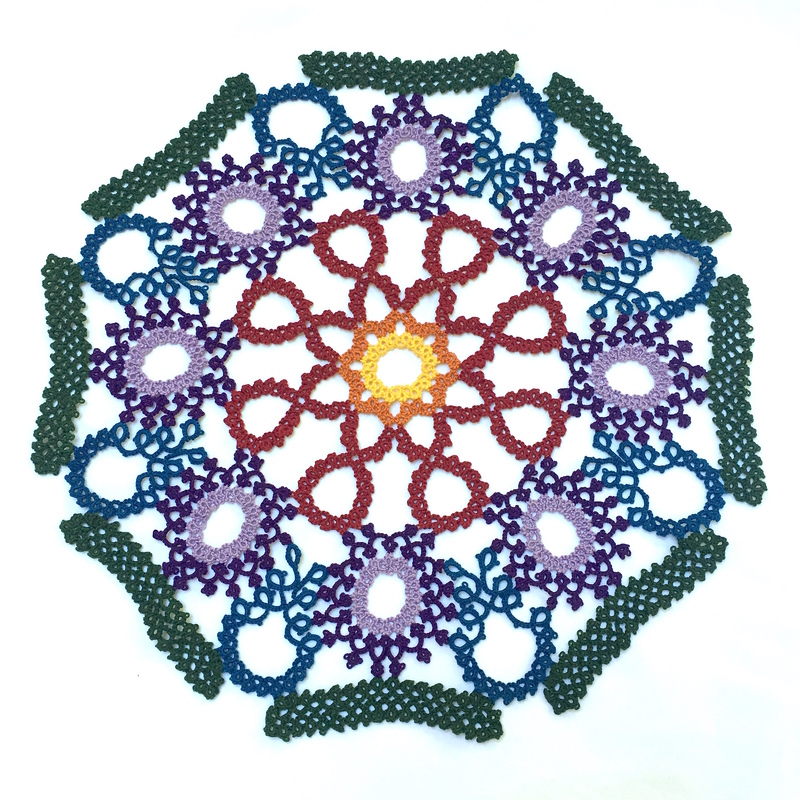 This one still has some more to go to fill the spaces between what I’m calling the yellow “petals.” I’m going to do them in the same green as the center. In hindsight, I wish I had done the green in brown. Then the parts between the petals in the green. I think it would look like a sunflower that way. I’m doing this one in Manuala, one of my favorite threads to work with. I’m so sad that they’ve been discontinued. I’ve been reserving what I have left for especially exciting projects. The 8 petals too up the WHOLE ball. I had only about a single shuttle full of thread leftover at the end of it. I think I probably did have to cut out some chunks after finding mistakes which would have wasted some as well. When I’m finished with this section I’ll be only about half way through the full tea cloth. I might do the third (out of four) sections after this, or I may just stop here and start a whole new one after this. Eventually, I’d like to have a nice finished version of the tea cloth for each of the 4 stopping points. Here’s the full piece again from the original Priscilla book. Still need to zoom in to see where I am. Here is the ongoing center of the tea cloth, now with the blue “half circles” done. 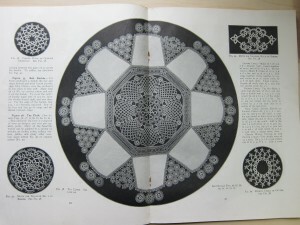 Actually, in the original book they’re called “Half Circle Joining Motif of Fourth Circle” which is a bit cumbersome. I call them the “Jellyfish motifs” which seems more accurate to their shape. I’m excited to have gotten this far along. All that’s left are the 8 “Oblong Motifs Outside of the Fourth Circle” and then I can call this one done. In this particular project all I wanted to get done and photographed was this first section. I’ve split the whole tea cloth into four sections and am trying to rewrite the pattern so that you could easily stop at the end of any of the sections and still have a really cool piece. 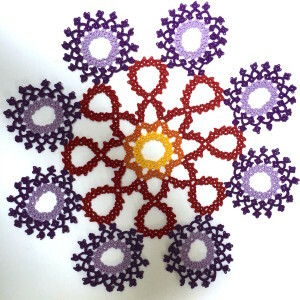 The whole thing is pretty intimidating by shear volume of tatting, but this first section is pretty straight forward and not actually very large compared to a lot of the other doilies out there. Here’s a close up of the jellyfish. I have been working hard on the tea cloth from Priscilla Book #2 lately. I’ve gotten much further along on another version of it, but today I wanted to share this new one that I started. 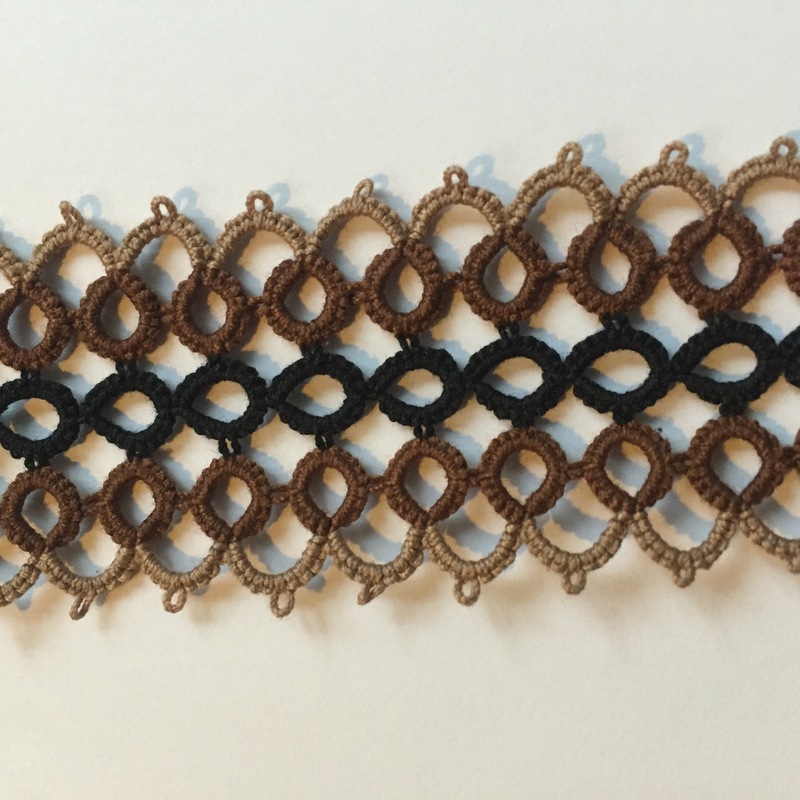 I’ve used split rings and chains to combine a lot of the little motifs that made up rounds two and three of the original and I realized that when done all in one color (as the other one I’m working on is) you can’t actually tell. So for writing out the pattern, I’ve started this new version in which each round is done in a different color. I think it helps make it much more clear. At least I sure hope so! I’ve actually almost finished with the round after this one, (which is done in blue) and I’ll post a picture of that soon. Then one more round (in green for the complete rainbow) and some work on finalizing the pattern. I’m pretty excited to have gotten this far, but of course, this is only the very, very center of what will be a much larger piece. For reference, here’s a picture of that. You’ll have to zoom into the center a lot to see where my little piece fits in. Well, it’s almost June, but I need to back-track a little and send out a huge THANK YOU to all the people that make Shuttlebirds and Camp Wannatat happen. Both events were amazing as always. I had a great time teaching at Shuttlebirds and learned a lot as always at Wannatat. Patti and Tess… special thanks to the two of you for making these events happen every year. I can’t wait for the next Wannatat in October and Shuttlebirds next April. 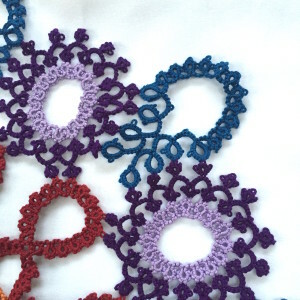 In tatting news, I’ve got a lot to get caught up on. This last week I’ve been really focused on coming up with new variations on the X’s and O’s pattern I taught at Shuttlebirds. 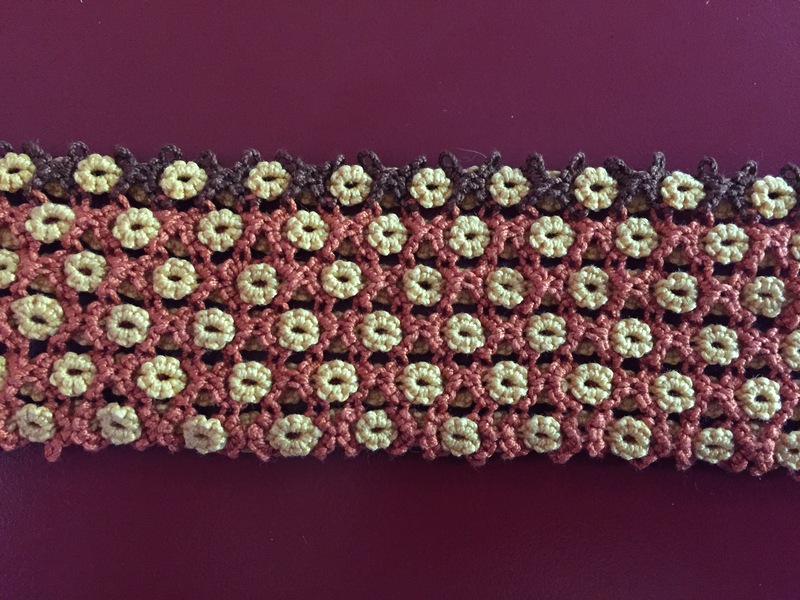 I learn the basic pattern from Janie Wannatata a few years ago and she threw out the idea of linking up multiple rows of it. Well, here’s my latest variation on that. In this version I’ve staggered the weave so that this checkerboard look comes out in the pattern. It’s been a lot of fun to experiment with, but it’s a very dense pattern so it’s very slow going as well. 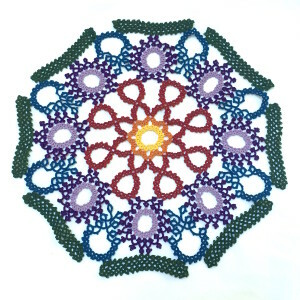 I’ve just started another version of this with beads. I’ll show a picture of that once I get a little further along on it.